When is a house not a home? Increasingly often, it turns out. Be it a holiday cottage for weekend getaways, a pied-à-terre in the city, a flat rented out for a bit of extra income, or an empty shell of bricks and mortar working harder for your savings than an ISA possibly could – multiple property ownership is rising. An important and symbolic feature of the shifting patterns of wealth accumulation in 21st Century Britain, here we explore how multiple property ownership is changing, who owns the second homes, and what the policy implications of these trends are. The 21st Century rise in multiple property ownership is set against a backdrop of the overall decline in home ownership over the past 15 years. 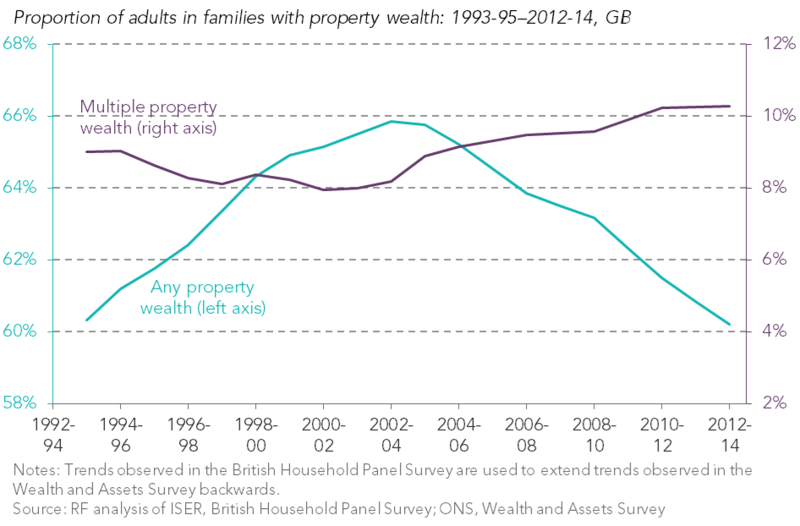 While the share of British adults in families with any property wealth fell 8 per cent in between 2000-02 and 2012-14, the share with multiple property wealth increased by nearly one-third (30 per cent). In 2012-14 four-in-ten adults had no wealth in property at all, but one-in-ten had wealth in multiple properties (5.2 million adults, up 1.6 million since the turn of the century). These twin trends – fewer people with any properties and more with many – underpin the growing concentration of housing assets that is fuelling the recent increase in overall wealth inequality. Disregarding mortgage debt (because of difficulties in identifying which properties mortgages are secured against), the assets held in second or additional properties had a gross value of £760 billion in 2012-14 (adjusted to 2017 prices) – that’s 15% of the £5.2 trillion held in gross property wealth overall. This equates to an average of £150,000 per adult with multiple sources of property wealth, a 20 per cent increase since 2000-02. 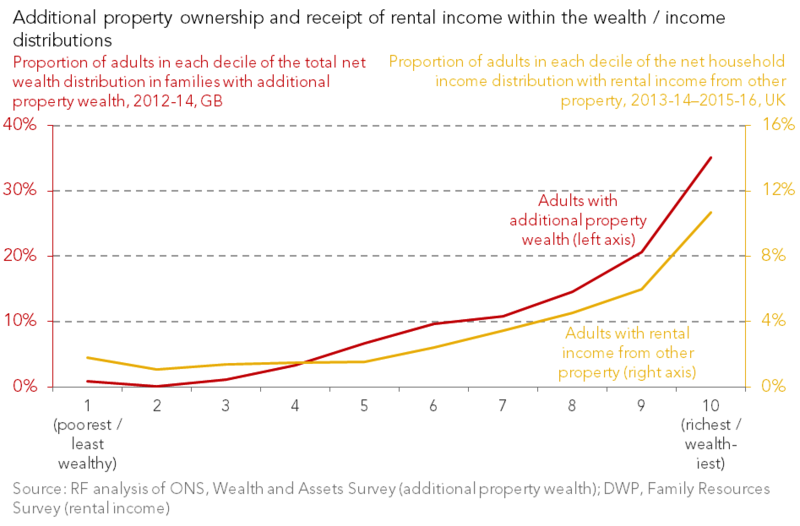 With average net total wealth just over £200,000 in 2012-14, and typical (median) wealth just £84,000, owning multiple properties clearly represents a huge wealth boost. Not only can multiple property ownership boost wealth – which is important for living standards over lifetimes and particularly in retirement – it also has the potential to boost incomes in the here-and-now, because these properties can be rented out. Consistent with recent growth in the private rented sector (which is provided by a mix of commercial institutions and private landlords), the proportion of adults in the UK receiving income from other property as landlords doubled between 1998-99–2000-01 and 2013-14–2015-16 – from 1.7 per cent to 3.4 per cent. Previous research suggests that the typical annual rental income among this group was around £6,000 in 2008-10 – more than a quarter of typical salaries at the time – underscoring the difference such a source of income can make to living standards. Half (52 per cent) of all the assets held in additional properties is held by the baby boomers, born 1946-65, and a further quarter (25 per cent) by generation X, born 1966-80. But of course we might expect this – wealth varies hugely over the life-cycle and peaks around retirement age. And as the name suggests, the thing about the boomers is that there are lots of them. 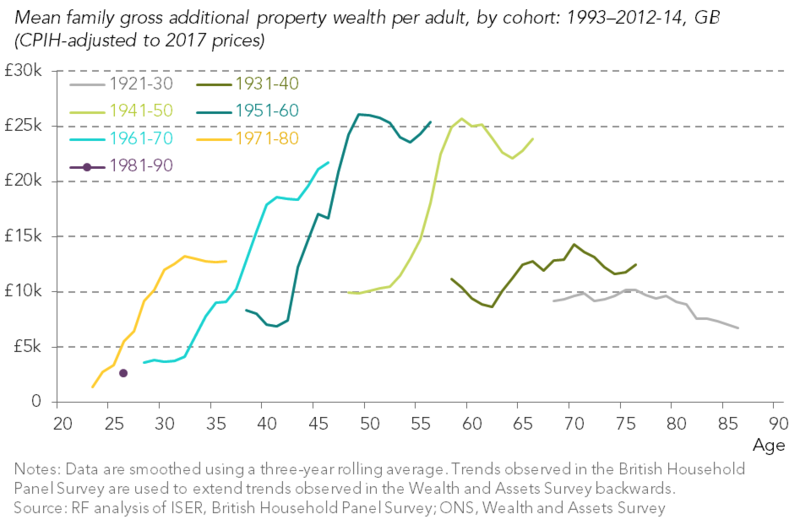 The chart below overcomes these challenges by showing average gross additional property wealth across all adults in successive birth cohorts and at different ages. What’s striking is the doubling of additional property assets for those born in the 1940s compared to the cohorts before them when they were the same age – it seems the oldest in society today never really got into the second homes game in a big way. All generation X and baby boomer cohorts then improve on their predecessors at the same age. However, the older millennials – those born in the 1980s – are the first cohort on record to under-shoot predecessors on additional property assets – they have less than half the amount that those born in the 1970s had at age 26. The inescapable conclusion is that those in prime age and early retirement today have so far been the big winners from the rise in second home-owning. Owning additional property is sometimes depicted as a common way for typical workers to shore up savings or for ordinary folk to boost their pension with rental income. But situating multiple property owners and private landlords within the wealth and income spectrums makes them seem far from ordinary. 88 per cent of additional property owners are in the top half of the wealth distribution, and 79 per cent of adults with rental income from other property are in the top half of the income distribution. Around one third of each are in the top decile of their respective distributions. Of course, you could argue that these comparisons to all other adults are a bit unfair. For example, we know that additional property assets are concentrated among the baby boomers who are currently at peak wealth-holding age. By the same token, the common argument that rent from other property is a way of boosting pension incomes means we might expect it to only really be a relevant consideration in retirement, when incomes are now slightly higher and people are less likely to be poor. However, the additional property owners and landlords look particularly well off even within these groups. For example, over four-fifths (82 per cent) of baby boomer second home owners are in the wealthiest half of their generation. And more than four-fifths (81 per cent) of pensioner landlords are in the top half of the pensioner income distribution. The clear message is that both across society as a whole and among their peers, those drawing on wealth or income from additional properties are disproportionately rich and wealthy. 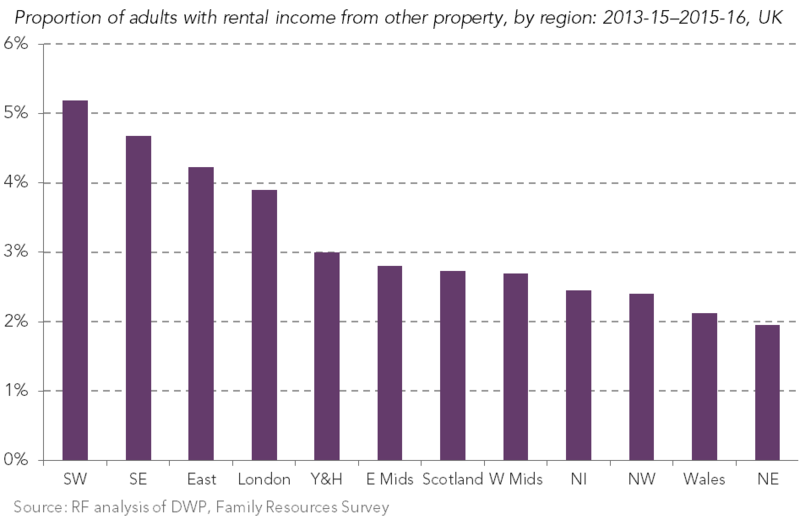 We don’t know where the additional properties are, but analysis of where those receiving rental income from them are based shows a particularly high prevalence in the regions that make up the south of England, as the chart below shows. Nearly six-in-ten landlords (59 per cent of the total) are found in the four regions where it is most common: the South West, South East, East of England and London. Unsurprisingly, these are the areas where incomes and average wealth are highest (and in the case of the South West in particular, a higher concentration of older adults will also contribute to this pattern). In sum, holding assets in more than one property has grown in recent decades, and can be a huge boon to both wealth and incomes. The second home owners are mainly adults in prime age or early retirement, are rich and wealthy even among their peers, and are most likely to be living in the south of England. Of course there are individual exceptions, but stepping back to the big picture: if you were painting an image of society’s affluent, this would be it. Given that younger generations are failing to accumulate wealth at anything like the rate of their predecessors, and that we have a housing crisis that manifests itself in concerns about security and quality for those renting from private landlords, this state of play seems far from optimal. And to be fair, this is one aspect of the shifting patterns of wealth accumulation in 21st Century Britain that policy makers have woken up to in recent years, with attempts at action. Stamp duty surcharges on second homes were introduced last year, and reduced mortgage tax relief for those engaged in buy-to-let came in this April. These steps have pros and cons, but there’s a case for thinking even more broadly – from implementing the commitment to tackle empty homes in the recent housing white paper, to greater regulation of private landlords and increased security of tenure to shore up tenants’ position. And from a taxation perspective, the reality of a larger second home owning group, made up largely of older, very affluent people cannot be ignored as we wrestle with the public finance pressures of an ageing society. These are options and challenges our Intergenerational Commission will continue to explore, because from the perspective of many of Britain’s real ordinary folk who still desire to own their home but find doing so increasingly out of reach, one house would be enough.